Being a counterfeit edition of the authentic volume on Logic pertaining to the Coimbra Jesuit Aristotelian Course, the two volumes of the Collegii Conimbricensis Societatis Iesu Commentarii doctissimi In Universam Logicam Aristotelis, nunc primum editi, Tomus Primus-Tomus Alter, was published by the Froeben Publisher (ex Bibliopolio Frobeniano), in 1604, i.e. two years before the publication of Sebastião do Couto’s genuine volume. The authorship of this so-called Logica/Dialectica Furtiva (an evident reference to Franco Furti oppidum where it was supposed the volume had been really published) is discussed. After a comparison of manuscripts from Lisbon and Évora, Friedrich Stegmuller concluded that the volume reproduced Gaspar Coelho’s lessons at the Jesuit University of Évora in 1584; moreover, Gaspar Coelho himself (not to be mistaken with his homonymous who was Superior and Vice-Provincial of the mission in Japan) was profiting from the lessons dictated by Francisco Cardoso (1547-1604) in 1571 in Coimbra. It can be recalled that in the first volume of the Coimbra Jesuit Aristotelian Course, Pedro da Fonseca alluded to such an exchange of teaching “common manuscripts”. It is likely that when he left the Society of Jesus, Gaspar Coelho sold the text to the Froeben Editors. It should be noticed that 1571, the year of Cardoso’s Coimbra lessons, almost coincides with the “thirty years” mentioned by Sebastião do Couto, in his approved Coimbra Dialectica (Ad Lectorem), in a reference to the Dialectica Furtiva, “written by someone in a so far disturbed century”. 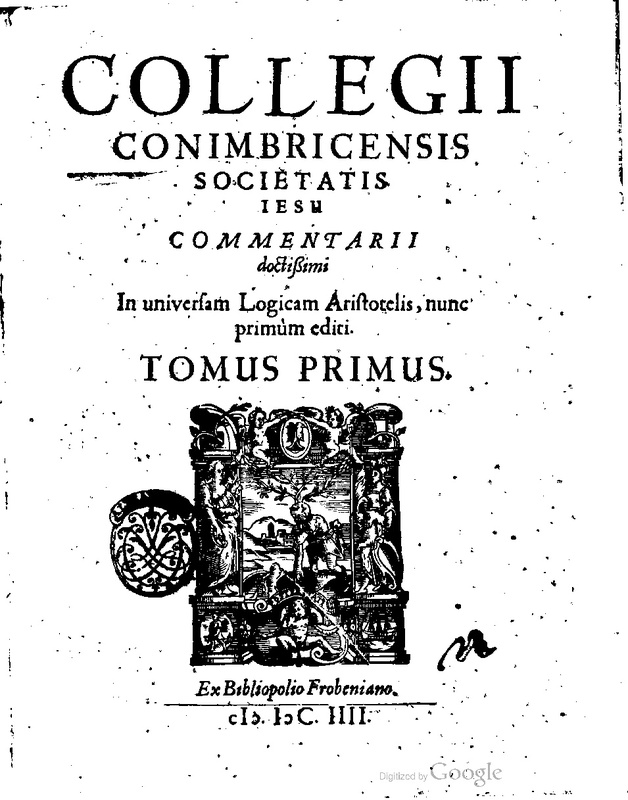 Published, obviously without the necessary licenses, the volume begins with a Preface to the Reader (Ad Lectorem) that affirms the importance of Logic to the sciences (Theology, Law, Medicine, Mathematics, Rhetoric), mentions the Coimbra origin of the book (fecit Collegium Conimbricense) and states, anonymously, that as soon as the commentary was known, a so great treasure could not but be immediately published. The first tome has 269 pages of commentary and ends with the De Interpretatione, the second one has 356 pages, begins with the Prior Analytics and ends with the first book on the Sophistical Refutations. It should be underlined that the Dialectica Furtiva and the Dialectica Conimbricensis give us two different stages of the Logic, as taught in Coimbra, by the Jesuits, separated by at least thirty years.